Just a quick post today after a great long weekend with friends and family. On Saturday, we visited a couple local wineries (Lenz Winery and Paumanok Vineyards) with my parents and sister. It's been a while since I posted a family portrait, so I thought I'd do so. More on the winery visits in coming days, including some pictures of Jackson's first barrel room visit. Nena and I both love riesling, but not always the same ones. When we visited the Finger Lakes last spring, our differing preferences arose at nearly every winery stop -- if the winery had more than one riesling. For the most part, I preferred (and prefer) the drier, more minerally styles and she preferred the semi- and off-dry wines. It isn't so much about the sweetness, but she prefers the richer fruit flavors -- the peach, tropical fruit, etc. And we both want riesling with racy acidity. That brings us to this wine, Heron Hill Winey's 2005 Riesling Reserve ($30). Winemaker Thomas Laszlo is perhaps best known for his ice and ice-style wines, but he also makes a few different table wines from the Finger Lakes region's signature variety, but this is probably my favorite. And Nena's least favorite. This wine is made from 100% Heron Hill Estate Vineyard-grown fruit from vines that are more than 30 years old. Yields are kept low. The vineyard is also sustainably farmed with herbicides or chemical insecticides strictly avoided. 192 cases were made. Extremely pale yellow-green in the glass, the nose is driven by intense mineral-slate aromas with just-ripe pear, lemon and lime zest and even a bit of petrol. A surge of slate and minerals greets the palate as well, with more pear and citrus zest flavors. Bone dry and light-to-medium bodied, the mouthfeel is lively with great acidity. It seems like a wine that has many years ahead. I'm glad that I have a couple more bottles in the cellar. Nena on the other hand, didn't like the intense mineral character here. But that's purely a stylistic preference, this is an under-rated wine from a winery that had a large, and varied portfolio. We served this wine on Thanksgiving, and I thought it worked extremely well, as quality riesling often does with a wide array of foods. I hope that each and every one of you is eating and drinking well today. Happy Thanksgiving. I'll be doing a brief wine wrap-up from our own Turkey Day dinner... but you can bet there was plenty of riesling and cabernet franc involved. It's true what they say. Sometimes the sum really is greater than the parts. That is certainly the case with the latest release from Palmer Vineyards, a white blend that Spanish-born winemaker Miguel Martin has named "Select Reserve." Retailing for around $25, Palmer Vineyards' 2007 Select Reserve is a blend of 45% chardonnay, 35% pinot blanc, 18% sauvignon blanc and 2% Gewürztraminer. Sometimes, when you taste blends like these, you taste each component grape in a distinct way... almost like tasting each in succession. This wine isn't like that. Sure, you can assume that the chardonnay is responsible for the ripe pear aromas and flavors. And it's likely that the sweet herbs on the palate come from the sauvignon blanc and the floral notes are the result of that squirt of Gewürztraminer. But there's a oneness to this wine that raises the individual pieces to create a greater whole. Each grape seems to always be there throughout, but each also stepping up at different times along the way. Pale straw yellow, this nuanced blend has a nose redolent of honeydew melon, pears, and honeysuckle with faint hints of hay and citrus zest emerging as it warms a bit. In the mouth, the flavors closely match those aromas with the addition of sweet herbs and subtle tropical fruit flavors that remind me a guava but aren't quite. It's medium bodied with a juicy burst up front and an almost-oily, glycerine mouthfeel on the mid-palate and finish, which lingers just a bit and ends on a floral spice note. There is just enough acidity here, but more would really lift this wine significantly. Still, this is an impressive first vintage for this wine. It paired well with cumin-mustard glaze pork chops. White blends have been very successful for other wineries, so it makes a lot of sense that Palmer is joining that fray. I expect to see more wineries doing it going forward. I was happy to hear over the weekend that Long Island wineries will be participating in a project to collect toys for underprivileged and sick children across Long Island. From Saturday, November 29 through Sunday, December 21, participating wineries will have collection boxes for visitors to donate new, unwrapped toys. The program is being coordinated by the John Theissen Children’s Foundation, a 501(c)3 Non-Profit Organization that has collected and donated more than 550,000 new toys to children in over 185 hospitals and child care facilities across Long Island since its inception in 1992. There will be collection boxes in the following winery tasting rooms: Castello di Borghese, Corey Creek Vineyards, Croteaux Vineyards, Duck Walk Vineyards, Jamesport Vineyards, Laurel Lake Vineyards, The Lenz Winery, Lieb Family Cellars, Long Island Meadery, Macari Vineyards, Martha Clara Vineyards, Palmer Vineyards, Paumanok Vineyards, Pellegrini Vineyards, Pindar, The Old Field Vineyards, Osprey’s Dominion, Roanoke Vineyards, The Tasting Room Peconic, Waters Crest Winery and Wölffer Estate Vineyards. I haven't heard what they will be yet, but many of the wineries will be offering special promotions to encourage toy donations during the collection period. It's great to see the local wineries supporting this cause leading up to the holidays. Get out there and support both the wineries and the toy drive. The New York Times is probably the newspaper in the U.S... if not the world, so you can imagine my surprise and happiness over seeing this blog mentioned in its pages earlier this week (just saw it online this morning). "The best wine blog for chatty reviews and news is Lenndevours, published by Lenn Thompson, whose day job is in Internet marketing. It is reached at www.lennthompson.typepad.com. Mr. Thompson has a good palate; his tasting notes are usually on target. Though clearly a cheerleader for local wines, he doesn’t hesitate to criticize." Over the years, Mr. Goldberg and I haven't always seen eye to eye -- on particular wines, on the role of blogging in the larger wine discourse, and a variety of other issues really -- but I'm honored to be included in this column. Other websites mentioned include my friend Eileen's blog, Cellarette and the official sites for the Long Island Wine Council and New York Wine and Grape Foundation. Thanks for the mention, Howard. Today, I offer my review of the third Croteaux Vineyards rose from the 2007 vintage (see the other reviews). This wine, the Croteaux Vineyards 2007 Merlot "181 Clone" Rose ($18) is the lightest and most delicate of the lot. Made from the 181 clone, from Pomerol, it was fermented entirely in stainless steel and is a pretty pale salmon-orange. The nose is light and fruity, with peach aromas dominating and a bit of strawberry. Similar fruit carries over to a light-bodied palate that also features nice, thirst-quenching acidity. It's surprisingly light on flavor, however. Even at room temperature, I was l was left wanting a bit more flavor intensity. Still, it's refreshing and would be good on a hot summer day. As it warmed just a bit over the course of an evening a bit of alcohol heat on the finish emerged, even though it's only 12.5% abv. I definitely enjoyed this wine's 10% barrel-fermented sibling, but Croteaux Vineyards' 2007 Merlot "3 Clone" Rose ($18) was fermented entirely in oak and aged for 5 months in older oak barrels... and I just don't 'get' this wine. I like that Croteaux makes "rose on purpose," even if it seems a bit insane in such a tremendous vintage to use all of that beautiful merlot fruit for rose. And, it's kind of interesting that they do three different ones (I'll post my review of the third tomorrow), but this wine is just weird. Sometimes weird is good. Here, I'm not so sure. Your standard light pink in the glass, the nose offers few hints as to its merlot origins. There are hints of dried cherries here, but they are buried behind vanilla, toasted almonds and roasted marshmallows. Dry and medium bodied, the palate offers similar character -- vanilla, marsmallow, caramel -- but even less fruit. The highlight is a deliciously creamy mid-palate that I liked more as the wine warmed. A bit of cherry joins toasty vanilla and light acidity on a lengthy finish. Blind, meaning blindfolded in this case, I'd probably think this an oddly cherry-inflected, barrel fermented chardonnay. Weird and really didn't hit my palate right. It's just not what I personally look for in rose. By the way, the "3" clone is from U.C. Davis. This year I wanted to do something a little different to celebrate Thanksgiving here on LENNDEVOURS. So, I've asked some local chefs to contribute some of their favorite Thanksgiving recipes and pick a local wine or two to serve along side. The turkey, obviously, is the centerpiece of most Thanksgiving celebrations, and David Page (seen at right), former executive chef and co-owner of Home in Manhattan, and current co-owner of Shinn Estate Vineyards has offered this recipe for roast turkey. This is actually the recipe that I'm going to follow next week, and it comes from David's cookbook, Recipes from Home. Preheat the oven to 350 degrees. Rub the cavity of the turkey with the orange halves, and then season it liberally with salt and pepper. Fill the cavity of the turkey with the orange halves, onion, garlic, celery, thyme and sage. Rub the turkey all over with the butter. In a small bowl, combine the tarragon, marjoram, coriander, the two teaspoons kosher salt and 1 teaspoon pepper and rub the mixture all over the turkey. Place the turkey on a rack in a roasting pan and lay the bacon over the breasts. Place the pan in the oven with the legs of the turkey pointing toward the back of the oven, and roast for three to three and one half hours, removing the bacon after two hours and turning the pan around every 40 to 50 minutes. The turkey is done when the juices run clear when a knife is inserted into the thickest part of the thigh or a meat thermometer inserted into the thickest part of the thigh reaches 180 degrees. If the breast becomes too brown, cover it with aluminum foil. Remove the turkey from the oven and let it rest, loosely covered with foil, for 15 to 25 minutes before carving. Serves 8 to 10. Wine Pairing: David recommends who wines from Shinn Estate for with turkey and Thanksgiving dinner in general: Shinn Estate Vineyards 2007 Rose and Shinn Estate Vineyards 2005 Cabernet Franc. Both have earthy-herbal notes that will work great. This Friday night, I'll be hosting This Twitter Taste Live for the first time, featuring the wines from Humanitas Wines. Owner-winemaker Judd Wallenbrock is someone I've known for years via email and this blog, and I really love what he's doing with this project. He makes small batches of wines (literally in his garage) and donates all of the profits to charity. All. Of. The. Profits. As we head into the holiday season, how can you not love the idea of a winery doing something like that? This Drink Charitably edition of Twitter Taste live is a joint venture between Humanitas Wines, LENNDEVOURS.com, Twittermoms.com, drinkcharitably.com and Twitter Taste LIVE. We'll be bringing together members of the wine blogging community, wine trade and consumers all over the world for what we hope becomes one of the largest online wine tastings in history. At this point, it's too late for you to order the wines for Friday, but I'd still encourage you to buy them for the holidays. They make a great gift because of the great story behind them and the juice is pretty darn good too. The first three can be purchased and shipped as a 3-bottle pack directly from the winery for just $45. And the pinot can be bought directly from Humanitas as well. And please make sure that you follow all of the action on Twitter at 8 p.m. on Friday. You can follow me here. 2007 marked Croteaux Vineyards' second vintage making wine from the merlot grown on their 10-acre property. Previously the fruit was sold (and some still is) to Channing Daughters Winery and Scarola Vineyards. Of course, owners Michael and Paula Croteau don't actually make traditional merlot with those grapes. They make rose -- 3 different ones from 3 different clonal selections. And, in an industry large enough now to demand niche producers, they are as 'nichey' as they come. They call it "rose on purpose." These three wines were originally a part of my "Week of 3s" but I think each warrants an individual post and, well, I'm the editor around here. So individual posts they shall receive. The 314 clone of merlot comes from the St. Emilion region in Bordeaux and this wine, made by Richard Olsen-Harbich at Raphael, was 10% barrel fermented with the remaining 90% done in stainless steel tanks. It's a pale orange-pink in the glass, and its nose is fairly expressive and fruity with lemony citrus, peaches, and red berries like strawberries and cranberries. The palate is medium bodied with more peach, cranberry and strawberry primary flavors. There are secondary, non-fruit flavor as well, mainly vanilla and earthy dried leaves. The red fruit-earthiness combo really marks this as a merlot. The acidity isn't what I'd call "bright" but it's nicely balanced and works well with the slightly creamy mid-palate. The finish lingers just bit with cherry, earth and vanilla flavors. I tend to like my rose super-crisp with high acidity, but this is a nice wine in a less-fresh, fuller style. The 10% barrel fermentation adds complexity without overpowering too. I've been remiss in recent months keeping you updated on the goings on with Wine Blogging Wednesday. I've forgotten to post about newly announced themes and I've definitely missed telling you about the 'round up' posts. No more. I am the founder of this little monthly party after all. I should let my readers know about it a bit more, right? So, it is with great pleasure that I let you know that November's host, Joe from 1WineDude has posted the round up. Thanks for hosting, Joe. Keep an eye out for December's announcement... for WBW #52. Stumbled upon this today. It appears that Ackerly Pond Vineyards is for sale. When owner Ray Blum passed a way a while back, most people wondered if this was coming. It appears that it has. I know that his family was at least trying to keep things going. I haven't heard anything from them in months, however. Finger Lakes Wine: Will Old Wines Mean New Respect? 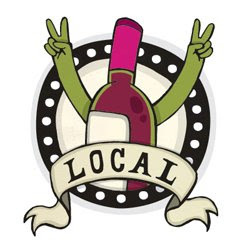 In an effort to continue to establish the Finger Lakes wine region as a producer of world-class wine, a first-time older vintage tasting of almost 70 wines produced from 1988-2003 will be held tomorrow, Friday, November 14, 2008 at Red Newt Cellars and Bistro on Seneca Lake. This tasting of a diverse collection of wines from past vintages is an important step for the wineries of the Finger as they travel the road toward carving out a place amongst the top wine regions of the world. Prior to this effort, there was no strong collaborative of wineries looking ahead to take the steps necessary to put themselves in line for consideration in future Wine Spectator Vintage Charts. Now there is a strong desire to carefully plot a path toward becoming a recognized world-class wine region with strategies that include establishing a vintage chart via the older vintage tasting and Wine Spectator submission. The idea of an older-vintage tasting of Finger Lakes wines was born when Morgen McLaughlin, President of Finger Lakes Wine Country Tourism Marketing Association, picked up a copy of the Wine Spectator 2008 Vintage Chart and noticed that Washington, Oregon and California were included in it, but not New York or the Finger Lakes. She then called Wine Spectator's senior editor and Finger Lakes wine reviewer, James Molesworth to get more specifics on why the Finger Lakes region was left off the the vintage chart. Among the reasons he gave were that "the vast majority of Finger Lakes wines are meant for immediate consumption, and the handful of rieslings that might show well with bottle age doesn't create enough of a critical mass to warrant a historical record via a vintage chart." And "if I feel like a body of wines I'm tasting every year suddenly merits a vintage chart, or if I feel like the readers are clamoring for one, I'll certainly take it into consideration..."
So with those guiding words and a visit to James Molesworth's office to discuss the logistics of putting the Finger Lakes older vintage tasting together for submission to Wine Spectator, several wineries in the region opened their wine libraries up to submit their wines for this momentous tasting. Wine Blogging Wednesday just cannot be stopped. Here we are, more than 4 years after its inception (this IS the 51st edition) and the theme is one of the few that shoved me way out of my comfort zone. Not only was I forced to leave my beloved state of New York, but I also had to try a style of wine that I know very (very very) little about: wines that are intentionally oxidized at warm/hot temperatures. That's why the one and only (thankfully!) Joe Roberts, known in the blogosphere as 1WineDude, our esteemed host, termed the theme "Baked Goods." Prolonged exposure to heat and oxygen are typically not something winemakers want, but these wines are, in essence, baked to mimic the long sea voyage these wines took through the tropics. There are many styles and 'reserve' levels of Madeira, but rather than repeat them all here, I'll simply point you over to Wikipedia. This bottle, which I picked up from Greene Grape for around $45 if I remember correctly, falls into the "sercial" style, the driest, and is labeled as a special reserve, meaning that it was aged 10 years. In the glass, it's a medium-to-dark gold-amber color. It's slightly viscous, but just barely so, perhaps because of the alcohol level (19% abv). The aromas are interesting here, bringing roasted almonds, dried citrus peel, dried figs, something that reminds me of some of the peaty Scotch I've had. It's much drier than I expected, with great acidity. There is just a ton of delicious nuttiness. here with more dried citrus and figs. The finish lasts what seems like minutes on end. The only other Madeira I've tasted before was much sweeter and underwhelmed, but I really like this wine. Best of all, from what I hear, I can hold onto it, even though it's open, for weeks, months or even longer before it starts to break down. It's already been bludgeoned by the elements and is already oxidized! Joe, thanks for shoving me from my comfort zone and for hosting this, the 51st edition of WBW. Keep an eye out for the announcement for next edition, hopefully soon! What do you get when you take an experienced wine executive from New York City and drop him into the Russian River Valley with two winemakers who also hail from New York? Apparently you get some delicious and surprisingly elegant chardonnays and pinot noirs that are undoubtedly California, but not what you might expect. Chris Donatiello was that marketing and sales executive for the Charmer Sunbelt group before teaming up with venture capitalist Bill Hambrecht. Together they purchased Belvedere Winery in Healdsburg, CA — a winery that had been making 125,000 cases a year and converted it into C. Donatiello Winery a boutique operation with a state-of-the-art gravity-driven winery that makes around 6,600 cases annually. Winemakers Troy McEnery, a Queens native, and Webster Marquez round out the team. I visited C. Donatiello Winery the day after the Wine Bloggers Conference concluded in Santa Rosa along with my blogger friends John from AnythingWine, Joe from 1WineDude, Becky from Smells Like Grape, Nick from Wine Scholarship, Thea from Luscious Lushes, Megan from Wannabe Wino and Patrick from Oenophilia. After two and a half days of tasting a lot (and I mean a lot) of Sonoma County wines, my palate was a bit fatigued and I was, quite frankly, planning to hit the local craft brewery to unwind before the trip home. I just didn't want to taste anymore big, inelegant wines. Lucky for me, McEnery and Marquez don't make wines like that. I tasted seven wines, a sauvignon blanc, three chardonnays and three pinot noirs, and not a single one was without merit. C. Donatiello's 2007 Russian River Valley Sauvignon Blanc ($24) was fermented in neutral oak and while ripe and fruity — as most California sauvignons seem to be — has just enough acidity for balance. A tropical nose gives way to bright apple flavors on the palate with lemons, minerals and hints of pineapple and mango. This is a broad, mouth-filling wine, but just the right acid brings balance. Not my favorite style of sauvignon blanc, but well made nonetheless. A 2007 Christie Vineyard Chardonnay ($38) was aged entirely in neutral oak. It's nutty with roasted apple and subtle spice. On the finish, there is a distinct apple skin note that I really like. Though perhaps not priced for everyday drinking, it would be great to have on a warm summer evening watching the sunset. The winery's 2006 Russian River Valley Chardonnay ($28) was probably the wine I enjoyed the least — and the most similar to that stereotypical "California Chardonnay" we all have in our minds. Aged for nine months in 50% new French oak, there is some roasted apple fruit character here, but flavors of vanilla, spicy oak and brown spice are a bit heavy for my liking. The 2006 Orsi Vineyard Chardonnay ($38) was my favorite and probably the most unique of the whites. The nose was tight at first but bright apple, citrus zest and mineral flavors were nicely paired with light toasty notes, faint butter and just a little spice. The finish was extremely long as well. Moving onto the reds, we started with the 2006 Maddie's Vineyard Pinot Noir ($61) which spent 10 months in 50% new French oak. A beautiful and even delicate wine at 13.8% ABV, the flavors ranged from dried cranberries to strawberries and briar with wisps of vanilla, herbs and toasted oak. Fruit forward but not over the top, this is a beautiful wine. It was the best pinot I tasted all weekend. C. Donatiello's 2006 Russian River Pinot Noir ($48) offers a burst of Christmas and baking spice on the nose with dark, ripe cherries, raspberries and vanilla. The most widely distributed of the winery's pinots, it's available at several restaurants on Long Island and in Manhattan, including Bobby Van's, Hearth, Le Cirque, Sparks Steakhouse and Veritas. Last, but certainly not least, we tasted C. Donatiello's 2006 Floodgate Vineyard Pinot Noir ($57), one that I think needs at least another year to 18 months in bottle. Made with fruit from 36-year old vines, it plusher and fruitier than the others — and yet still taut. With vigorous swirling and an hour or so in my glass, sweet red cherry and cola flavors emerged with vanilla, cedar and lots of structure. I hope to taste this one again in a few years. I'd be remiss if I didn't mention the winery's aroma garden, which is gorgeous and planted with flora with aromas and flavors that mimic those of chardonnay and pinot noir. It's a very cool idea and one that I'd love to see some Long Island wineries do for merlot. Last night, as a part of my Week of 3s project, I tasted three different Baco noir wines from three different Hudson Valley wineries. These were actually the first Baco noirs I had ever tasted and after the tasting I'm still not sure that I quite know what to expect from the hybrid variety. They were all quite different. So what is Baco noir exactly? It's a cross of Folle Blanche (a French vinifera wine grape) and an unknown American grape from the Vitis riparia family. It first created by French wine hybridizer Maurice Baco, so that's where the name comes from. At one time Baco noir was commonly grown in France, but by European Union regulation, the commercial use of hybrid grape varieties is restricted. In 1951 the variety was brought to the cooler viticulture regions of the United States, such as New York, Michigan, Mississippi, Wisconsin, Pennsylvania and Oregon. In New York, there are an estimated 240 hectares of Baco noir currently grown. As I sat down to taste these wines from Hudson-Chatham Winery, Warwick Valley Winery and Benmarl Winery, I had no idea what to expect. Most red hybrids don't hit my palate quite right, but I'm always opened minded. I started with Warwick Valley Winery's Black Dirt Red ($11) a (I assume) non-vintage wine that is 100% Baco noir. In the glass, it's a bright ruby red with a thin magenta rim. The nose isn't overly expressive, even with vigorous swirling, but it did offer some light cherry aromas and some raisins and earth. On the palate, it's medium-light bodied and fresh tasting with lively acidity that would work well with food I think. The flavors are a little underripe with some cherry, earth and dried fruit flavors. It doesn't seem like this wine saw any oak either. It reminds me a bit of some steel-reared Long Island cabernet francs I've tasted from cooler years, but there's also something vaguely Gamay-like about it as well. Next in the trio was the Benmarl Winery 2006 Estate Baco Noir ($28), a completely different experience. Where the Warwick Valley was a little thin and underripe, this one is ripe and rich. Clearly darker in the glass, it's a medium-dark crimson. The nose is also much more interesting with cherries, raspberries and cocoa powder aromas and a sprinkling of black pepper. The palate is rich, soft and chocolaty with bright red fruit, sweet vanilla and hints of smoke. The tannins are low, so I'm not sure how much longevity this wine has in it. The finish is medium-long and ends with a red apple skin note. with Without knowing much about the grape variety, I'm tempted to say that this one is manipulated quite a bit, but I don't dislike it. After it was open for a few hours, the chocolate/cocoa flavors became a bit less dominant, which is a good thing. I look forward to trying this wine again tonight. Last in the grouping was Hudson-Chatham Winery's 2007 Baco Noir Reserve ($19), which has the most structure (both tannins and acidity) of the three and might not be quite tasting its best yet. Similar in color to the Benmarl, the nose offers red cherry, raspberry and caramel-vanilla aromas. Medium bodied and a bit rustic, this small production Baco (85 cases) is youthful and a bit tight. Cherry and blackberry flavors are there, but not expansive. There's also some vanilla and oak, which are a bit front-and-center at this point. There's something I like about this one though. But more on that soon. I'll be re-tasting all three tonight and adding my star ratings to the reviews and updating my notes as needed. Events sometimes receive an exclamatory billing only to draw attention to an antithetical subtext. The title of the "Riesling Shoot-Out," the brainchild of John Zuccarino of Silver Springs Winery and wine author Thomas Pellechia, evokes a line-in-the-sand Wild West gun fight between Finger Lakes and German rieslings, with only the biggest and baddest wines left standing to proclaim victory. Of course, the results were far more mixed, and therein lies the point. The big critics and the publications they work for consider Germany the home of riesling and treat her wines well, giving many a score above the coveted 90-point mark. As this website and others have noted, great wines from the Finger Lakes often hit a ceiling of 88 or 89 points, begging observers to ask, "How can so many Finger Lakes rieslings can get so close to 90 but no standouts emerge from the pack?" It's a question that both Lenn and I have asked here on LENNDEVOURS as well. Last Saturday, a panel of 16 judges representing wine blogs, local media, two major wine publications, and even the New England chapter of the German Wine Society, descended on Glenora's hotel and dining facility on Seneca Lake to blind taste a round of 15 rieslings. I was privileged to be one of the sixteen judges. We tasted the 15 wines, three glasses at a time, in the same order. The organizers told us that these wines were all rieslings, and that they represented Germany, the Finger Lakes, and a single Canadian outlier. No other information was given. The judging sheet asked us to provide some general impressions about aromatics and varietal taste, and then asked us to give a numeric score on the 100-point scale. After the tasting was complete, the organizers revealed that there were two repeats (a 2006 Wiemer and a 2006 Prejean, both Finger Lakes wines) in the 15 wine program, so we had really only tasted 13 wines. All of the judges immediately realized, with some mix of humor and horror, that we all had given different scores to the same two wines, with a few of us granting wildly different scores. At the end of the post I will list the wines tasted during the competition. The general results exhibit what many would expect: the Finger Lakes held up just fine. Four of the six Finger Lakes wines received scores of 90 or above with a total of twelve votes for this distinction divided amongst the four wines. Five German wines received scores of 90 or above, with 15 total votes divided between these rieslings. The Canadian wine received two scores of 90 or above. The Wiemer and Prejean were the Finger Lakes standouts. The German wines with the most 90+ acclaim were the Donnhoff and the Messmer. We're going to find out this week on LENNDEVOURS as we embark on a fun little week-long project where I'm going to blind taste three wines with some sort of connection every day and write about them. Three rieslings from Peconic Bay Winery from the 2003, 2004 and 2005 vintages. Three 2007 roses from Croteaux Vineyards that are made with three different merlot clones. Three 2005 varietal dessert wines from Macari Vineyards: a chardonnay, a sauvignon blanc and a viognier. This should be a fun week. Look for the first post tonight. Twitter Taste Live is surely one of the most exciting things going on in the online wine world today... and I'm thrilled to be hosting for the first time on November 21 at 8 p.m.
What was once a monthly event has grown to the point that I can barely keep up with all of the TTL goings on, but I'm really excited to tell you about the one I'm hosting later this month. I know what you're all thinking: "Which New York winery has Lenn worked with on this?" Well, this time around anyway, the answer is "None of them." As dedicated as I am to drinking locally produced wines, for this event I'm working with owner-winemaker Judd Wallenbrock of Humanitas Wines. I've written about Humanitas before because I love what they are doing -- making small lots of wines (literally in Judd's garage) and donating all of the profits to charity. All. Of. The. Profits. Get the wines and join us on Twitter at 8 p.m. on November 21. You can follow me here. Not every wine-related happening from my recent trip to California was directly related to the Wine Bloggers Conference. One non-WBC event was a trip to C. Donatiello Winery in Healdsburg. I'll be writing more about the visit and the wines (which were among the best I tasted on the trip) but for now, I wanted to share this video I took of owner Chris Donatiello showing us the aroma garden. All of the plants offer flavors and aromas often found in the two varieties they focus on -- chardonnay and pinot noir. Thanks to both Chris and also to Joel Quigley from Paige Poulos Communications who set the whole thing up. The following is a guest post from Bob Madill, owner of Sheldrake Point Vineyards and Chair of the Finger Lakes Wine Alliance, who recently attended Copia's RieslingFest 2008. Nothing like picking a few Finger Lakes rieslings to showcase in Napa, California at Copia. What a novel idea. A Riesling festival in the heart of Cab land. So on behalf of the Finger Lakes Wine Alliance (FLWA) country mouse traveled to Napa lugging cases of wine to pour at RieslingFest on October 19, 2008. Ten dry Rieslings from 2007 and all awarded a Wine Spectator score of 84+. Copia, the "non-profit discovery center whose mission is to explore, celebrate and share the many pleasures and benefits of wine, its relationship with food and its significance to our culture," held a one-day festival dedicated to riesling and by golly the Finger Lakes was going to be there. And Copia and staff did a great job. Terrific organization and the tasting included some tasty morsels to accompany the wines. The day started at 10:30 a.m. with a panel discussion about riesling in today’s market. Very encouragingly, rather than turning over in bed, 50+ participants turned out to engage in a discussion about the growth in riesling (the fastest growing white varietal in the United States) and the challenge in buying the right style given it’s range of sweetness. Imagine buying peanut butter and having to guess chunky vs. smooth. Jim Trezise of the New York Wine & Grape Foundation introduced the new ‘Riesling Taste Scale’ developed by the International Riesling Foundation (IRF). This graphic, which is meant to be included on a wine's label, includes a scale from "Dry" to "Sweet" to be marked appropriately by the producer. Now doesn’t that just spoil all the fun in guessing? The audience was very well versed in riesling speak and several mentioned their passion for dry and frustration with unknown sweetness levels. Then for the tasting. There were 20+ producers from 15+ regions showing 60+ wines. Most were from California but New Zealand, Germany, Washington, Michigan, Oregon and mais qui, the Finger Lakes were also represented. Under the moniker ‘The Other White Wine’ an enthusiastic 110+ tasters enjoyed riesling in all it’s forms including bone dry to Ice Wine (I did sneak in our 2007 just for fun) with artisan foods ranging from sausage to sushi. These were true Riesling fans. The quality of their interest was exceptional. The Finger Lakes wines were arranged from the driest of the dry to the not so dry of the dry. Tierce at one end and the Lucas at the other with at least two wines from each lake. And for the most part all of the tasters worked through all of the wines... to great acclaim. They liked our dry wines. Quel surprise! Not. The Finger Lakes was the least known region but attracted the spotlight based on the quality (and value) of the wines. My overall conclusion was that Finger Lakes dry riesling wines have a terrific opportunity out in Cab land. Maybe more so than in oh-so-sophisticated New York City. Our challenge has to do with the nature of the three-tier distribution system and the logistics involved. Stay tuned riesling aficionados. We are working on it. I just read this morning that a new Hudson Valley Wine Bar will be opening at Albany International Airport. I haven't been able to dig up any further information about it like who is running it, what wines will be available, etc. but this is a great thing. I think that every regional airport should have a wine bar that offers the wines (and beers) made in the neighborhood. If anyone flies into or out of Albany, stop by and let me know how it is.